Gentlemen Only, Ladies Forbidde n? If your husband, boyfriend or even father ever tells you that Golf stands for “Gentlemen Only, Ladies Forbidden”, do us a favor. Kindly tell them it’s not true. This is an old joke that doesn’t seem to want to die. Truth is, the word Golf comes from the Dutch and Scottish words for “club”. That’s not to say golf hasn’t been a sport dominated by males, both historically and in modern times. But all that is changing fast. Just last week, the British golf club Royal St. George, which once posted the sign “No Dogs, No Women”, voted to allow female golfers. 90% of the voters favored the decision which ended a 128-year male-only policy. So when did things start changing for female golfers? And what is the expected trend? We run the stats for this week’s By The Numbers. 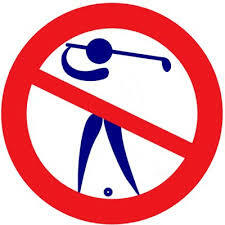 25 – Number of golf clubs in the U.S. that limited memberships to men only in 2012, according to NBC. The most well-known is Augusta in Georgia. 19% – Percentage of all golfers who are women, according to the National Golf Foundation. 80 Million – Number of golfers worldwide, according to HSBC. 30 Million – Number of female participants the World Golf Foundation (WGF) is charged with having by 2017, according to Golf Week. 48% – Number of women who say they want to learn golf with other beginners, according to the National Golf Foundation. 156 – The number of women golfers who will compete for the first major championship for women. The KPMG Women’s PGA Championship will be held this June. An analysis of Google Searches for women’s golf shows that while it has fallen from an ’05-’06 spike, it has been relatively flat for years. Compared to searches about golf as a whole, which have declined dramatically. A preview query of Channel Signal data estimates that there were over 522,000 English posts on Facebook, Twitter, Tumblr and WordPress in July alone about Women in Golf. A preview of related keywords that are used in those posts gives you an idea of what people associate with women and golf. The popularity of golf on the whole has been in decline over the past decade. The National Golf Foundation stated in 2014 that “200,000 players ages 35 and younger abandoned the game over the past year”. It was golf’s worst year since 1995. Learning curve, cost and time commitment appear to be at the top of the list of reasons for the dip. Americans are so busy these days that 18 holes is too heavy a commitment, especially if you’re a noob. A game deeply rooted in history and tradition, it seems golf is finally starting to see the light. More women are playing golf leisurely. Women are being accepted at the professional level. And even the oldest, most staunch of golf clubs seem to be changing their ways: promoting shorter rounds and family friendly clubhouses. When revenues and popularity are in decline, there’s plenty of room for growth. So what do you do? You let the other half in. How Can Golf Brands Better Understand their Female Customers? From apparel to hats and specially-sized golf clubs, the women’s golf segment has huge potential. But in order to penetrate the market, golf brands must understand the unique wants and needs of women. Do they really like the skirts, or would they prefer shorts? Patterns or solids? Is the weight and length of the golf clubs accurate? What unique challenges do they have that a brand can address? There are a couple of ways to poll this group. Surveys, focus groups and research panels all have their place, but also challenges. The truest way to measure this audience is by polling them via an existing dataset: product reviews. Top golf brands such as Titleist, Callaway, TaylorMade, Nike, Adidas, Ping, Mizuno and more can measure and understand the entire competitive landscape by aggregating and benchmarking product reviews for their products against their brands.